1. Do most people have no jobs and spend all of their time making their blogs look so much more fabulous than mine? 2. Is there a secret society, a master's program, or an on-line correspondence course one takes to unravel all the blogging mysteries, such as finding out what TT, HNT, permalink, blogrolling, and the like are? 4. Are most bloggers also artists, continuously creating gorgeous background images (or am I supposed to call it wallpaper?) for their blogs? 5. How come everyone but me seems to know how to make hotlinks on their site? 6. Does someone get paid to do nothing but create fun games for the rest of the people who have no jobs and play them (including me)? 8. When someone leaves you a comment with a guestion, do you reply on your blog or theirs or both? 9. What else is there in the blogging etiquette handbook that I don't know about? 10. Where do I get this etiquette handbook? Amazon? 11. Does everyone end up thinking in "blogging mode" during their regular day? 12. What is a "regular day"? - we're all here all the time!!!! 13. Does not knowing the answers to these questions make me greatly, or only somewhat, inadequate? Have a happy HNT, TT, and all the rest everyone!!! I LOVED this post. I am so happy I made my way over here. Not to worry with me...I know very little about blogging myself...only that I'm hooked! Great post! Visiting this evening from Michele's! Great blogging is so much more than the ability to make a pretty site. What most folks forget is that good writing makes a great blogger. Everything else is just fluff. You're just fine on all fronts. Christi's right: change nothing. The substance of your blog is what matters most. And you've got that in spades. 1. I can't figure that out. I wonder how many people actually work when at work. A lot of people are stay-at-home-moms... but how do they do it while the kids crawl up their legs? I'll never know. 2. It comes with time and asking. I have had to and stll have to ask what things mean, especially the acronyms. LOL, BRB, SAHM, RAOFL, etc. 3. No - not me. 4. Some people pay other bloggers to design their blogs. Diary of Nello is one designer I know of..
5. If you look on blogger help, there is a section that says, "how to do more with links" or something like that. Before my computer died, I could have just given you the link... because I had it handy... Won't dwell on that. 6. I don't think so, but if so, I think I would be good at that job. 7. Most people don't like getting tagged. Sometimes they get angry. For future reference, I don't mind, and simply won't play if I don't feel like it. 8. Ok. This confuses me. Stephen says leave the answer on their blog, which seems the polite thing to do because some people won't come back and read the comments again. I've noticed, however, that most people don't do that. I try to answer on my blog so that people will be able to follow the conversation (I like that myself) but then copy and paste it in their comments too in case they don't come back. 9. Feked if I know. Maybe we should take this time in our lives that we don't have work, and write one?? 11. Yes. I have read about other bloggers who are constantly assessing real life situations to see if they are blog worthy. Sort of how I look at things as if through a camera lens. 13. The cheezy, truthful answer is that I think this is an awesome community, and I don't think that you would ever be considered inadequate for anything!!! Was I really supposed to answer these? I understand where you're coming from...totally. That commenting thing gets me too. Yes, alot of people seem to have alot of time on their hands to make all that stuff. I mostly had time on my handswhen I was bored at work. I work for myself so the boss couldn't get ticked though...ha! Thanks for visiting! Great post. Just look at it as, you are a pioneer in the blogosphere and you are blazing your own path...and doing a good job. I enjoyed everyone else's comments...especially Carmi...I get mesmerized by other's fluff sometimes and tend to remember that instead of what they wrote. Be yourself and you can never go wrong. Tia, I am just as clueless as you are regarding blogs and all their various parts. I have had a lot of advice over the last 20 months or so - but I have yet to put any of it into practice. Good luck; maybe someone nice will take you under their wing. Great questions, because I have the same ones all the time! My blog is BORING (design-wise). I focus on the writing. In fact, I just posted my first ever photo in May, which tells you how far behind I am! 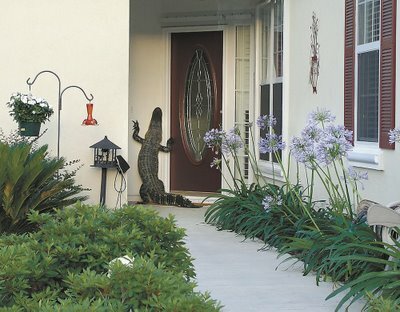 I did love the photo of the gator/croc at the door - YIKES! Michele sent me and I'm glad! OK, I pasted the code in but, of course in didn't show up. I'll send you an email. fabulous babe. i was gonna sendf you the code too but glad stephen got there first. it just takes a bit of time.. you my dear are doing great!! Steve, thank you for the code - I'll see if I can't get the hang of that. And for the rest of you - thank you for all the great feedback - and for frequenting my site! Well, I can definitely identify where you are coming from. I know sooner figure something out (and I'm quite pleased with myself) I spot something that everyone else seems to know, that I never even heard about. Hi Tia! I don't know where to post replies either, but I just replied to you on my own blog... seemed weird to come over to your place and talk about my husband's flu. Hey for links, when you are creating a post, if you click and drag the mouse over some text so that you highlight it and then you click the little button that looks like a sideways 8 or an infinity symbol over the planet earth, blogger will open up a box where you can paste the link address, and then it will automatically make your text a hotlink for you. I agree with all above that it's the writing that counts, and I think your well-written blog also looks terrific, because you scanned in and included your own artwork! 1. LOL no they have friends that are blog designers...at least in my case! 4. I'm a photographer, but for some reason, I've not used any of them for wallpaper. 5. Hmmm...I can show you how to do that one! 7a. meme: something that's all about you! 8. Depends on how much time I have. If I'm pressed, I'll just leave a comment on their entry if they've done a meme, if not, I'll send an email, but I'll tag it so that I go back and check out their blog later. Stick with it long enough, and you'll catch on. I can help too. Feel free to email me at kebmillard at gmail dot net. I don't type the actual address so the spam hackers can't see it. Anyway, Michele sent me today. Congrats on being her site of the day.